Inspired by conversations on the Food52 Hotline, we're sharing tips and tricks that make navigating all of our kitchens easier and more fun. Today, we're talking about potatoes. Potatoes are the workhorse of the holiday table. Roasted or mashed, sweet or white, they're delicious any which way and lend themselves to easy, satisfying side dishes. 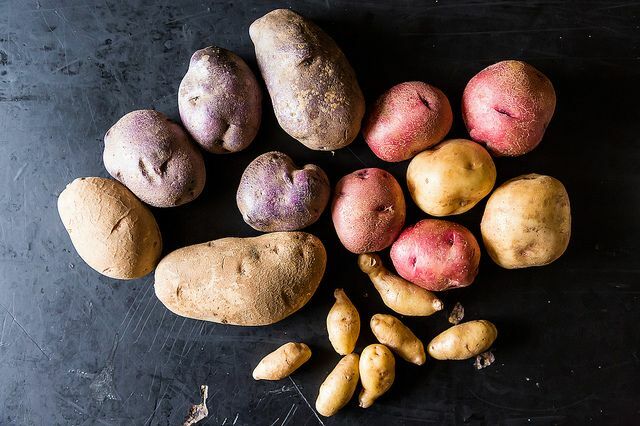 Run out to the store to grab a few pounds of potatoes to mash or fry, though, and you'll find countless types: from Red to Russet to lesser-known heirloom varieties. So which potatoes do you pick for the creamiest mash or the crispiest roast? We're here to school you on spuds and make that trip to the grocery store a little less stressful. Armed with knowledge of different varieties and their best uses, you'll be setting your table with the best side dishes in town. The factor that differentiates varieties of potatoes is their level of starch. Starches absorb water in the presence of heat, which causes them to expand and thicken. Potatoes contain two types of starch: amylose and amylopectin. Amylose molecules break down in the presence of water, while amylopectin molecules are compact and therefore hold together better when cooked. Starchy potatoes, often referred to as "baking" potatoes, have a high starch content and a light, mealy texture. Because of their high amylose content, they soak up water easily and lose their shape when boiled or simmered. While this can be a benefit for thickening soups, these tubers are best mashed; they'll soak up butter and cream beautifully. Starchy potatoes also make perfect french fries. For the perfect mash, you'll want to steam your potatoes -- steaming keeps the potatoes from getting waterlogged, and therefore improves texture. To avoid gluey mashed potatoes, rinse them mid-steam: this will remove the amylose, too much of which can lead to gumminess. Looking for a snack? High starch potatoes also make great potato chips. 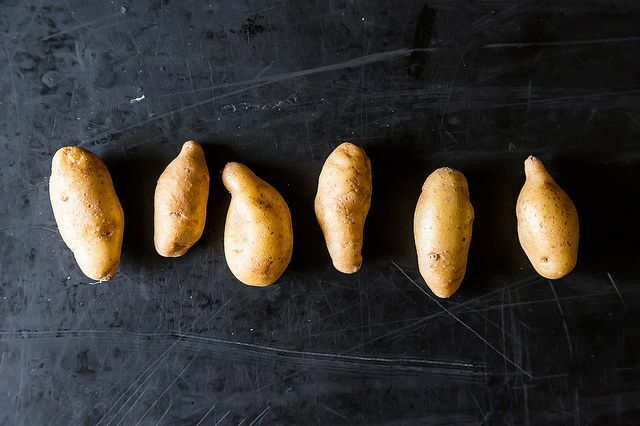 These are the goldilocks of potatoes: not too starchy, not too waxy. Also known as "all-purpose" potatoes, medium starch potatoes hold their shape better than starchy potatoes, but boast a creamier texture than waxy potatoes. They're perfect for gratins -- especially Yellow Finns, with their creamy texture and great flavor. 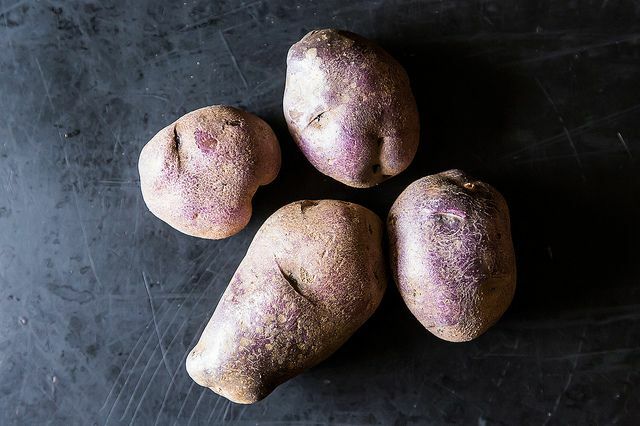 Those purple potatoes you see at the farmer's markets boast more than just beautiful skins. 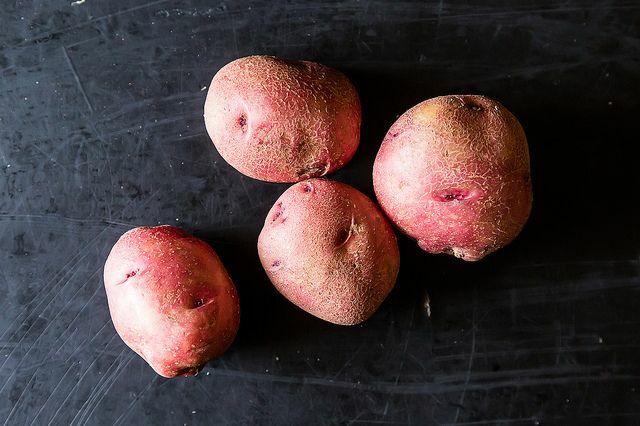 Traditionally grown and cooked in the Peruvian Andes, they're great steamed or in potato salad. Or, mash them up for a purple puree that will brighten your table and intrigue your guests. These potatoes are firm, waxy, and smooth. Sometimes labelled as "boiling potatoes", they have the lowest levels of starch and the highest levels of amylopectin. This means that they will hold their shape better when cooked, and are perfect in potato salad, in soup, or simply boiled. They're also great roasted! Cook's Illustrated recommends covering potatoes with foil for part of the roasting time to keep them moist and minimize cooking time. Halfway through cooking, remove the foil and flip them for even browning. 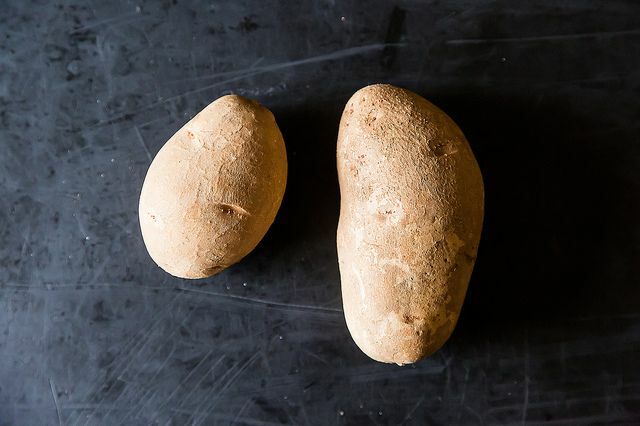 When selecting waxy potatoes, remember that size matters: the larger ones will have a higher starch content. Potatoes keep the longest when stored in a cool, dry place. Want them to keep even longer? Throw an apple in the bag. Apples give off ethylene gas that will keep your potatoes from sprouting. 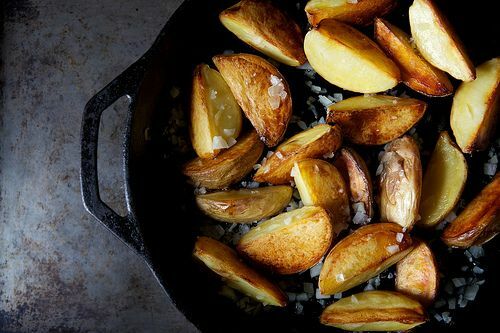 What are your favorite potato recipes? Got any cooking tips that we missed? Share them in the comments section! Hmmmm, intrigued, but I need way more details. Steam potatoes: in a basket? Is it okay if they sit in the inch or so of water? A picture would help....this is a radical departure from any prep I've seen. Peel, then rinse? Is that the "rinse midway?"'. Or do you mean halfway through steaming take them out, rinse and return? I am confused...intrigued, but very uncertain of how to actually do this without lots of trial and error on my part. That said, I threw my russets in a few inches of water, skins on, no salt?! ?, and am starting to steam them.....I'll take a stab at the halfway rinse as inspiration guides me in about twenty minutes. I grow a potato that is called Colorado Rose. It has red skin and the flesh is also pinkish red. 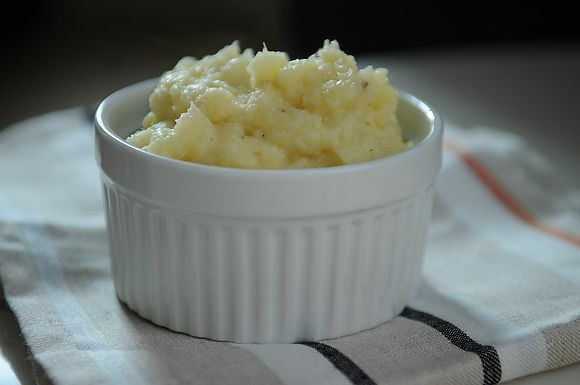 It is a delicious, starchy potato and makes the very best mashers. Thank you, Marian, for this handy compilation of useful information!! Love the tips on rinsing the russets while steaming for mashed, and covering the red potatoes in foil at the outset. ;o) P.S. Always the iconoclasts, we're not having mashed potatoes, or any white potatoes, on Thursday. But I will be making some over the weekend! My mash is about to be the best it has ever been. Thanks for this!